Hello! I hope you all had a lovely Christmas and got lots of nice things! Personally I got some awesome stuff from my family this year and i'm extremely grateful for all of it. Here are some of the things I got. As I am obsessed with sushi my Mum got me a sushi kit, it comes with rice, two sauces, wasabi paste, seaweed and a rolling mat. I've never made sushi before so i'm really excited to try it! 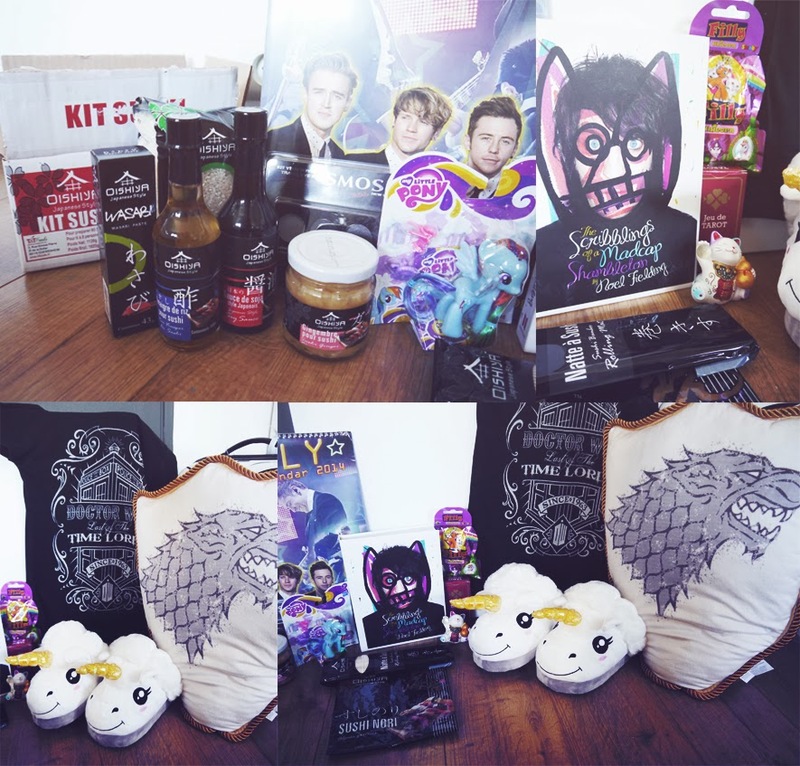 I also got a few unicorn things, as I have a strange obsession with them. I got a Rainbow Dash figurine, some unicorn slippers and a little lucky dip unicorn which strangely enough was called Rose and is an artist. What are the odds! 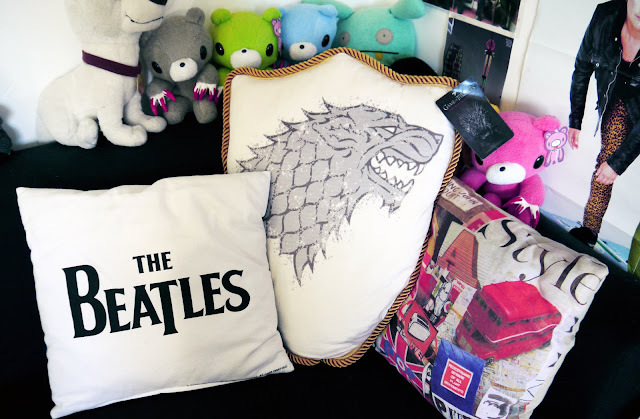 As you can see, I got a huge game of thrones pillow with the Stark sigil on it. My mum also got my brother one but with the Targaryen sigil on it. On the back of mine it says "Winter is coming". I love this pillow so much and the fact it's in the shape of a shield add that extra effect to it. Something I was really happy with was Noel Fielding art book, The Scribblings of a Madcap Shambleton, I love Noel Fielding anyway, especially in The Mighty Boosh, but also being an art student an all I really love to see how other people draw and paint and it's actually really interesting to see another side to him. One of my favourite things was the Doctor Who t-shirt, I love the style of the print, it reminds me of something old school Panic! at the Disco would have done. 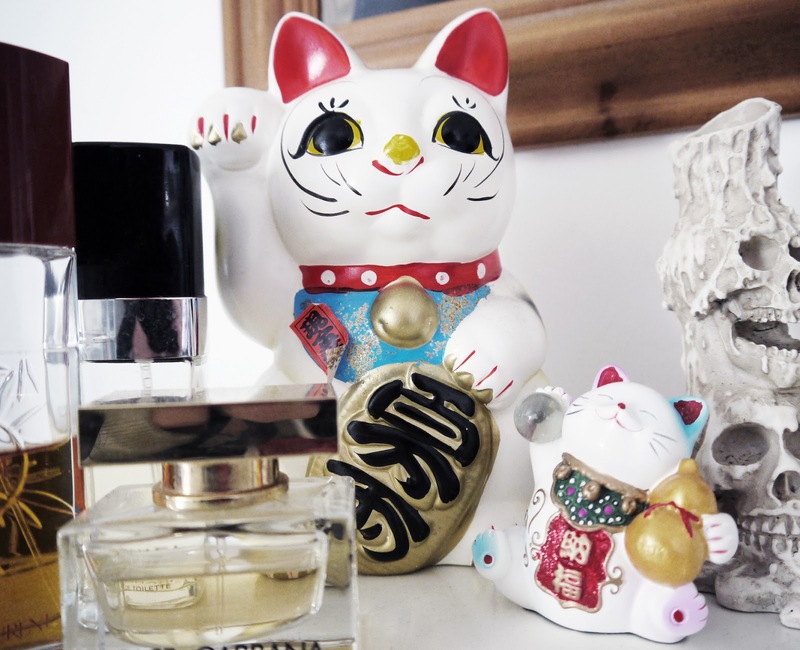 I also got another Maneki Neko to add to my collection, My mum got it from this amazing shop not far from me that sells precious stones and jewellery. He's really cute and he's probably another one of my favourite presents. So there we have it! The presents from my boyfriend haven't got here yet, but he did also buy me Mists of Pandaria what was really nice of him. I got him The Smashing Pumpkins Gish Deluxe Edition as they are his favourite band and he's been wanting it for ages. Along with the new Ratchet & Clank game, Into the Nexus. Last but not least, It's not christmas until you watch Doctor Who, and this one was a sad one. I won't say much because I don't want to spoil it for anyone. But I'm going to miss Matt Smith so much, he was such a good Doctor! Anyway, once again I hope you all had a nice christmas and a happy new year! Please tell me in the comment below what you got for christmas because I love reading about what everyone else got!